It has been a very hard year for everything in my life other than completing the 1000 nautical miles. After setting it up ready to start in January I was happy that finally I had spent some time learning how to create a website, something that I had wanted to do for years now. 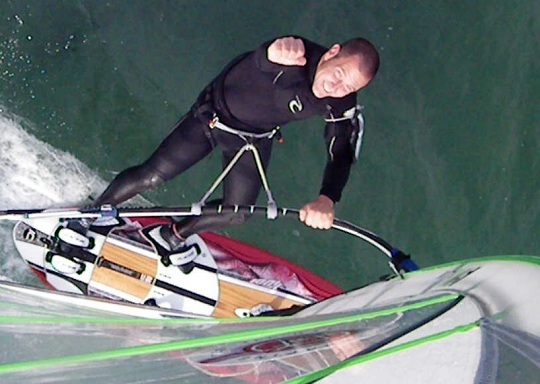 Also I recieved a lot of support for it from various other websites, windsurfers and friends. The £1000 goal was already looking easily achievable when I actually started windsurfing the 1000nmi, in January the monetary target was nearly at the halfway point. This was thanks to a few very generous donations from friends and a few windsurfers online that I am still yet to meet in person. January came and I was off to a great start, I doubled my distance goal for the month. February left us windsurfers in the doldrums with very little wind. This continued through until the end of March. By this point I was starting to get really worried that the goal was not possible with such a lack of wind. I had only completed a total of 134nmi so in my head I realised that just over a tenth of the distance was sailed and a quarter of the year had passed! Then for the following 10 weeks or so we had enough wind for a session every other day. It got to the point where I was camping out at Portland Harbour every weekend just to get on the water as soon as I woke up on a Saturday or Sunday morning, windsurf most of the day and sleep ready for the next morning. At the start of May I went for my personal best in distance and destroyed it and two other endurance goals. In one day I managed to sail over 200km, which is a bit over 100nmi. It was only stopping many of the prescription drugs I was on after my heart attack that made this possible, I did not even ache as much after that one day that I do today after windsurfing for one hour yesterday now I am back on them (Statins). By the end of May I was two thirds of the way to completion with a huge distance windsurfed that month. I hope to beat this soon! June was again quite a good month, not as many windy days but my fitness was hitting its best levels in years so staying out for hours was easily possible. By the end of the month there was only 66nmi left to do, basically 3 easy after work sessions. The first week of July saw some of the best winds we had for a long time. South south west winds on Portland Harbour allow for a good run up in near flat water with stong gusts of wind close to the shore as you bear off along the bank in even flatter water. I went out with the intention of getting a personal best on one particular day, and in one of the runs I managed to get my other goal for the year of 35knots. I was over the moon. To some this may not seem a lot but for me on Portland Harbour I was really pleased. This left me with one more session to go to get over 1000nmi. With hardly anyone else on the water I went over 1000nmi in glorious sunshine. It was brilliant knowing that I had reached a good level of fitness after a heart attack and achieved this. The rest of July brought very little wind and by the end I had strange pains in my chest again, in a different way and a different place to when I had the 'Myocardial Infarction' (posh name for Heart Attack). On the 1st of August, one week into the well deserved holiday from teaching I was taken to hospital barely able to breathe. This stopped me trying to complete my new target of 2011nmi but it did mean a few more generous people donated and brought my monetary goal up to £1000. So I had completed all of my targets but had fallen ill again. My work already has me on a formal warning due to having time off after I returned to work after recovering from a heart attack. I have now had 3 months off following the multiple pulmonary emboli (blood clots in lungs) and am still in a fair bit of pain if I go without painkillers. I am going to go back to work I hope in the new year but know they will put me on a second formal warning causing me a lot more stress. I was hoping for some opportunities to arrise out of this website and through other contacts and old friends. There are some possibilities but nothing that looks like it will pay a 'liveable' income in the short term. All through the summer holiday I was hoping to recover, and perhaps put myself under far to much pressure to do so. I wanted to get back to work like nothing had happened but the pain got worse before it started to get better. The last weekend of the holidays was the National Windsurfing Festival, which I had been invited to attend as the charity fundraiser. It was clear to me within minutes of starting there that I was not fit to stand in a classroom full of children and teach. The event itself I will write about in my 2011 Review Part 2 next week, it deserves its own article and I have been meaning to do one since I was there. I have not done much windsurfing since the summer compared to the rest of the year. I got out a few times in October but paid the price for it with a lot of pain at the end of the month and well into this one. Perhaps I overdid it by taking part in Weymouth Speed Week, or I think more likely the Statins that they restarted me with in October are (very)slowly killing me. I have never ached so much in my life, and cant think straight on them at all. Just when I felt like I was recovering well I feel back at square one. I have now tried the 3 main types of Statin, and need to see a 'Lipid Doctor' to discuss other options. I can get out for some short sessions when other people are around but dare not risk any more. I am not sure how I can get fit again as per medical advice when these tablets destroy muscle like they do. The government wants a lot of people on them as well as they reduce the cost of heart disease, what costs will they increase in the long run I wonder? Apart from the second part of this article; where I will write about the National Windsurfing Festival and thank those who helped me with it, I want to put that part of my life and 2011 well behind me. The Just Giving Link will remain on here for the rest of November and then I will take it down and move on. Hopefully I can return to work soon and stop the painkillers, some days are a lot better than others at the moment but I do feel like I am getting better now.